"GOLDEN YOUNG ENTERPRISE CO., LTD." IS A PROFESSIONAL MANUFACTURER AND EXPORTER OF "LADIES FASHION BELTS, MEN'S BELTS, METAL BELTS, PLAIT BELTS, MEN'S SUSPENDERS AND CHILDREN SUSPENDERS" IN TAIWAN. 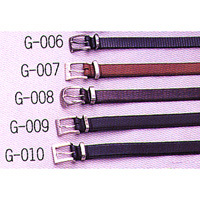 WE OFFER VARIOUS DESIGNS AND BEST QUALITY BELTS AT A COMPETITIVE PRICE FROM TIME TO TIME. THE FULL SET CATALOGUES WILL SEND TO YOU UPON RECEIVING YOUR INQUIRY.